National Drink Wine Day is Feb. 18. If your response to that is, “Isn’t every day Drink Wine Day?” then this blog post is for you! Here are the best spots in Wichita to raise a glass in celebration of National Drink Wine Day, or any day for that matter. 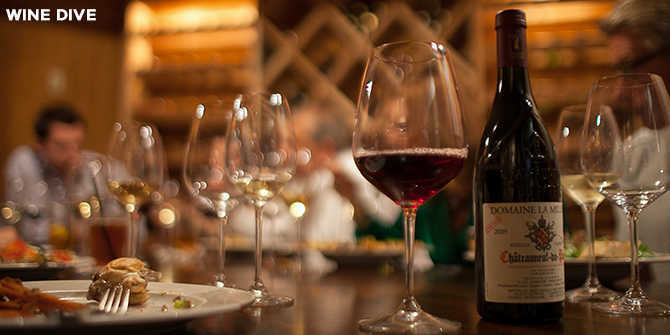 Wichita is proud to have three restaurants that earned an Award of Excellence in Wine Spectator’s most recent ratings. The magazine’s annual awards recognize restaurants whose wine lists offer interesting selections, are appropriate to their cuisine and appeal to a wide range of wine lovers. One-glass awardees typically have wine lists that offer at least 90 selections and two-glass honorees typically offer 350 or more selections. Wine Dive was one of 1,093 restaurants to earn a two-glass Best of Award of Excellence designation while Siena Tuscan Steakhouse and Chester&apos;s Chophouse & Wine Bar were among 2,414 to win the one-glass award. Brothers Brad and Brent Steven started the Wine Dive wine list from scratch and worked with distributors to mindfully add smaller-production, harder-to-find wines, including organic wines. The brothers like to offer standout pairings to Kansas diners – who often need a nudge to move beyond the standard pairing of Napa Cab and steak. Siena Tuscan Steakhouse is at 104 S. Broadway in downtown Wichita, Kansas, on the ground level of the trendy Ambassador Hotel, the state’s only AAA Four Diamond property. Locals and travelers alike enjoy the urban style and sophistication of the dining room that is flooded with natural light during the day and offers a subdued ambiance in the evening. For a true culinary experience, book a five-course or eight-course chef tasting and add the wine pairing. Chester’s Chophouse & Wine Bar offers waterfront dining at 1550 N. Webb in northeast Wichita, Kansas. The classic American chophouse setting features rich mahogany, smooth oak flooring, handcrafted lighting, local artwork, one-of-a-kind furniture and glove soft leather booths, all with sweeping water views. Chester’s wine bar is centered on a 1,000-bottle cellar with 50 offerings by the glass. Owner Mike Issa is known for his passion for wine service at Scotch & Sirloin, 5325 E. Kellogg in Wichita, Kansas, so it’s no surprise that every seat has a vino view. The nearly 50-year-old fine-dining restaurant has a 1,100-bottle wine room off the lobby and recent major renovations included adding a wall of wine that separates the main dining room from the bar. A custom-made suspension system creates the illusion that the wine bottles are floating in the air. Another restaurant with a wall of wine is Greystone Steak and Seafood at 9719 E. 21st in Wichita, Kansas. They offer an extensive, custom wine list along with hand-crafted cocktails and premium well drinks in a fine-dining atmosphere. The menu includes seafood flown into Wichita and hand cut by the head chef and wet-aged, Midwest, corn-fed beef seared to your desired temperature and rested. If you’re looking for a more casual setting or a wine and chocolate pairing, stop in at Cocoa Dolce Artisan Chocolates. It’s part of the Bradley Fair shopping, dining and entertainment destination at 2132 N. Rock in Wichita, Kansas. Kansas&apos; only Master Chocolatier creates exquisite handcrafted artisan confections. Have a seat in the state’s only chocolate bar and enjoy chocolates, wine, craft beer, coffee and gelato. Grace Hill Winery and Vineyards uses grapes grown on its 11-acre family vineyard, located about 25 minutes northeast of Wichita, to make both dry and sweet wines, red, white and rosé. The winery offers free tastings with three wine flights to choose from. No appointment is necessary for groups fewer than eight and the tasting room is open noon to 6 p.m. Friday through Sunday and 10 a.m. to 4 p.m. on Monday and Thursday. Free 20-minute tours of the vineyards are available at 1 p.m. and 2:30 p.m. Thursday through Monday, with an additional tour at 4 p.m. Friday through Sunday. Wyldewood Cellars opened to the public in 1994 with its elderberry wine, made from wild elderberries growing on the family’s farm. Now with several locations in Kansas, it’s still family owned and operated with its main operation south of Wichita, just west of Exit 33-Mulvane on I-35. They offer free tastings of their 32 varieties of fruit, berry and grape wines, pure elderberry juice concentrate, as well as homemade gourmet jellies, syrup and fudge. Wyldewood is open Monday-Saturday 9 a.m. to 6 p.m. and Sunday noon to 5 p.m.
ABC Discount Wine & Spirits has six locations in the Wichita, Kansas, area. Score 20 percent off your purchase on Wine Wednesday and 20 percent off case wine every day. Beyond Napa Retail Wine & Spirits, located at 338 N. Mead in the Old Town district of Wichita, Kansas, encourages you to expand your wine horizons Beyond Napa. Their “old world” atmosphere and unique decor make them look expensive, but most of their wines are priced in the $12 to $25 range. They carry wines from all over the world, including small, artisan wineries, that are chosen because they&apos;re excellent wines and great values. Bonus: the store has at least one bottle of wine open for in-store sampling every day! Remember to drink responsibly on National Drink Wine Day and everyday!